This week Kathie and I attended the conference on fire ecology put on by the Wisconsin Prescribed Fire Council. 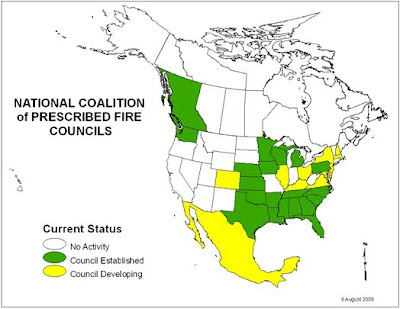 The Wisconsin Prescribed Fire Council is a coalition of government agencies, organizations, and individuals striving to make the use of prescribed fire in Wisconsin safer and more accepted for all practitioners. The meeting, held in Stevens Point, Wisconsin, was attended by well over 300 very knowledgeable people. Although fire should always be used as part of an integrated management system, it is the single most important tool of the restoration ecologist, and the least expensive. The term "prescribed" means that fire is being used in an intelligently controlled fashion, based on a written plan (the prescription) that lays out in considerable detail the conditions under which the fire will be lit. The attendees at the conference were mostly from Wisconsin, but there were some also from Minnesota, Michigan, and Illinois. A couple of the invited speakers were from farther away. Most of the attendees worked for various governmental or nongovernmental agencies. The Wisconsin DNR, was well represented, of course, but other agencies included the U.S. Fish and Wildlife Service, the U.S. Forest Service, the U.S. Army, the Nature Conservancy, and lots of county parks and forestry agencies. Also attending were employees of a number of companies that do contract work on restoration ecology. There were even a number of volunteers who do lots of prescribed burns. The quality of the presentations in the various talks was high , and the content was interesting and useful. These are only some of the topics, since some of the sessions ran in parallel. The attendance at all the sessions was good, and the Q & A was excellent. This is the second conference that the Wisconsin Council has held, and presumably they will be held biennially. Those who read this blog know that I am a big fan of the UW-Madison Herbarium. It is a major resource for anyone doing restoration ecology and its web site is priceless. Check out the resources in other Midwestern states to see how lucky we in Wisconsin are. Today, Saturday, January 31, 2009, the Wisconsin State Journal (on the front page!) has an important article on the Herbarium and its services. Check it out. And then take a look at the Herbarium web site, which you can reach at this link. It is worth a walk up Bascom Hill to see the Herbarium. When you get to the top, south of the Lincoln statue, is Birge Hall. Walk in the front door and there to your left is the imposing entrance to the Wisconsin State Herbarium. Follow the hall until you see the large room with the large filing cabinets. Each cabinet holds hundreds of specimens, and the Curators will be happy to let you see any species you are interested in. According to the newspaper article, the Madison herbarium is the third largest in the country in a public university (after Berkeley and Ann Arbor). That may be true, but the web site of the Madison Herbarium is lots more user friendly! How many species in a planted prairie? When we have visitors at Pleasant Valley Conservancy, we are sometimes asked how many species we have in our planted prairies. Folks are often surprised when I say there are over 100. I think this surprise arises because the USDA requires a much smaller number in prairies planted under the Conservation Reserve Program. However, one of the watchwords of restoration ecology is "diversity", and this means as large a number of species as possible. Another factor is that none of our former agricultural fields have constant characteristics. Because of slope and drainage factors, different parts of these fields vary from dry-mesic through mesic to wet-mesic, and even (in the case of the Valley Prairie) wet prairie. Thus, some of the species we have been planting grow in one area but not in another. With time they sort themselves out. I have been making surveys in the all of our planted prairies, starting with the second growing season. In the three planted prairies that were planted the longest ago, I have detailed records. Toby's Prairie: planted 1998, 10 growing seasons, 146 species. Pocket Prairie: planted 1999, 9 growing seasons, 142 species. Valley Prairie: planted 2002, 6 growing seasons, 136 species. Toby's Prairie is on the ridge top and has the most dry-mesic habitat. However, part of Toby's Prairie slopes gradually to the north, and in this area there are wet mesic species, such as mountain mint and closed gentian. Pocket Prairie has the most complex topography. It is in a basin below the white oak savannas and receives drainage from a ravine at the northeast corner. Hard rains pour down through one part of the Pocket Prairie and exit at Pleasant Valley Road. There is quite a bit of wet mesic habitat, as well as lots of mesic areas. But at the upper end of the Pocket Prairie conditions are really dry mesic, and this is where we see lots of little blue stem. We knew when we planted the Pocket Prairie that there was a lot of variability in moisture, and planted appropriate species in areas where they were most suited. Valley Prairie actually grades directly into real wetland, and at its border is sedge meadow and cattails. It also receives runoff from the Pocket Prairie. During the heavy rains of June 2008 we had a real stream running for several days. Not surprisingly, cup plant, a wet-loving Silphium, grew very well along this stream. When these three prairies were planted, we prepared three separate seed mixes, dry-mesic, mesic, and wet-mesic, and each was planted in its appropriate place. As the species developed, they sorted themselves out. (Technical bulletin. (Wisconsin Dept. of Natural Resources), No. 188) Madison, Wisconsin: Wisconsin Department of Natural Resources, 1995 58 pgs. Although this publication is now out of print, it is available on-line through the UW-Madison Digital Collections (an outstanding resource for anyone interested in restoration ecology!). Finally, I want to emphasize that we have never been satisfied with a single planting. In subsequent years we replant all of these prairies, as other species become available. The snow is still good at Pleasant Valley Conservancy, and yesterday was a great day, with lots of sun and upper 20s F. Kathie, Susan, and Marci worked in the barn hanging all the seed bags back up and then snow shoed to the end of the ridge. Nice to be able to combine business with pleasure! "The Cliff Germain Award for Excellence in Community-Based Restoration will be presented to Tom and Kathie Brock of Madison. The Brocks purchased 140 acres near Black Earth in the 1980s and since then they have worked tirelessly to restore prairie, savanna, woodlands, and wetlands, including one of the highest quality savanna restorations in the Midwest. Their Pleasant Valley Conservancy is open to the public for hiking and nature study and has been dedicated as a State Natural Area. Tom and Kathie have also coordinated and funded much of the management of Black Earth Rettenmund Prairie State Natural Area." The Awards will be presented at the annual MAS banquet on Wednesday, March 18 at the UW-Madison Memorial Union. Thanks, Madison Audubon and all those who supported our award! With the temperature below zero F and a foot of snow on the ground, it takes quite a bit of optimism to think about spring, but we have faith that it will eventually come. Today we started making our seed mixes, which will be planted after our spring burns are complete. This past fall we collected seeds from well over 100 species, and plan to get them on the ground in early spring. We should have planted some areas this past fall/early winter, but ran out of time. For the past six years or so we have prepared a species list in Excel, with columns indicating what habitats each species is found in. The habitats include dry, dry-mesic, open savanna, closed savanna/woodland, wet-mesic, and wet. Some species grow in more than one of these habitats, so they are added to more than one mix. A small part of this spreadsheet is shown at the bottom of this post. We calculate what percent of each species will go in each habitat type, and then start making the mixes. If a species is to be planted in both dry-mesic and open savanna, for instance, then it will be divided between those two mixes. The whole procedure is more complicated than that, but this gives the idea. At the end of the work, we end up with a set of large bags for each habitat type. After all the mixes are made, the bags are hung in the barn until spring. In the spring, when we start to plant, the first thing we do is pour all the bags of a given seed mix out on the concrete floor of the barn and mix thoroughly. Then add sawdust and go out and plant. 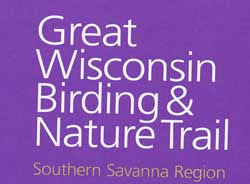 The Great Wisconsin Birding and Nature Trails are an excellent project of the Wisconsin DNR, Bureau of Endangered Resources. 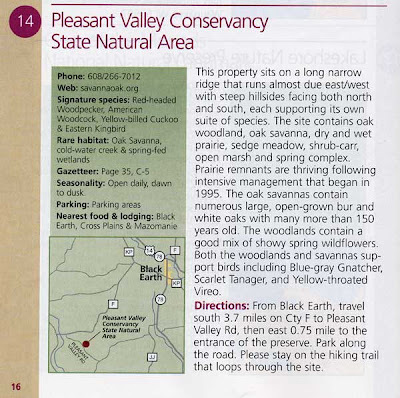 The new one covering the Southern Savanna Region, just out, includes Pleasant Valley Conservancy. Free copies of this publication can be obtained from the BER by calling 608-266-7012, or dropping a note to Wisconsin DNR, P.O. Box 7921, Madison, WI 53707. Hopefully, spring will come and we'll start to see birds again! 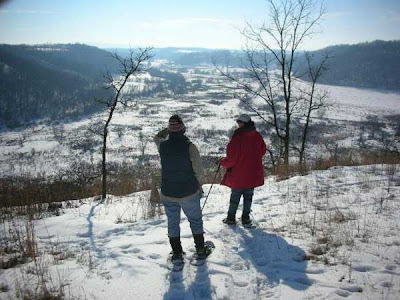 Landowners in southwestern Wisconsin: are you members of the Blue Mounds Area Project? If you can see Blue Mounds from your land, or pass it by on the way to work (who doesn't? ), then you should be a member! A nice series of talks is scheduled for the upcoming weeks. Even if you are not a member, these talks are open to you. I have pasted the details below. Here is our line up for our Winter Ecological Education Series. Please feel free to share this with others or post to a different list. We're hoping for great turn outs. 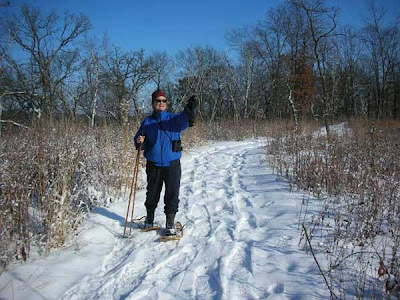 The Blue Mounds Area Project (BMAP) will sponsor four educational evening seminars this winter on a variety of topics for land owners and conservationist interested in native landscape restoration and protection. The Thursday evening events are all scheduled for 7:00 pm to 9:00 pm at the State Bank of Cross Plaines located at 1740 Bus Hwy 18-151 E. in Mount Horeb (next to Culver's Restaurant). The meeting room is upstairs; stairway is immediately on your left after the first set of entry doors. Refreshments will be served. January 15. Funding Your Conservation Project - An overview for landowners to the alphabet soup of public and private financial assistance available for habitat, water quality and land improvement and protection projects. Agency representatives from the federal USDA Natural Resources Conservation Service, U.S. Fish and Wildlife Service, The Nature Conservancy Inc., Pheasant Forever, WI Dept. of Natural Resources and others will give short presentations and answer your questions. January 29. Stream and Wetland Restoration in the Driftless Landscape - Principals of local stream ecology and review of local projects that are aimed at creating and restoring stream habitat and improving water quality. Panel presentation with representatives from WI Dept. of Natural Resources, Dane Co. Land and Water Conservation and H2O Underwater Habitat Inc.
February 12. Native Seed Collection and Propagation - Learn the principles of native seed selection, stratification, germination, and transplanting from Corrine Daniels, Director of Restoration Nurseries for Applied Ecological Solutions and Blue Mounds Area Project Ecologist Cindy Ramseyer. February 26. Citizen Monitoring on Land and in the Water - An introduction to the Blue Mounds Area Project's citizen-action monitoring project focusing on savanna and woodland habitats. Becky Olson, the executive director of the USRWA, will discuss citizen monitoring efforts along stream corridors and how that information is being used in policy and conservation today. (DATCP) and the American Farmland Trust will hold a two hour workshop to describe the tools that could be available for landowners and local municipalities to conserve farm land. The Working Lands Initiative Meeting will be Thursday, January 22, 1:00 pm to 3:00 pm. Tools that will be described include updates to the Farmland Preservation Program, creating Enterprise Areas across the state to focus efforts, and tax credits, the purchase of conservation easements on farms using state funds to be matched with federal, local or private dollars. For more information on DATCP's Working Lands Initiative, visit www.datcp.state.wi.us/workinglands. For more information contact: Carroll Schaal, (608) 437-6247 or Cindy Ramseyer (608) 523-4213. The Sandhill Crane Wet Prairie has had a different history than our other planted prairies. It is not from a former ag field, but from a highly degraded wooded area. Link to history of the Crane Prairie. We have just completed assembling the first species check list (after the third growing season): 87 species. Here is a link. The Crane Prairie provides an example of what can be done if the goal is to turn any old piece of land into a natural area. Expensive, but it can be done! For the last ten years we have been doing the traditional Xmas bird count for the Audubon Society at Pleasant Valley Conservancy. It's an interesting exercise, and sometimes a challenge because of the weather. That wasn't a problem this year, as the photo of Kathie shows. But the bird count was quite low. The snows came early again (like last year), but perhaps more significant, so did the cold weather. Lots of zero (and even below) days. One of the earliest years for Lake Mendota freeze-up. If you were a bird and had wings, wouldn't you head south? For the first hour of the count, we saw almost no birds. Finally we stumbled on a cluster of the usual suspects (juncos, tree sparrow, blue jays, etc). This turned out to be at the east end of the Conservancy, near a neighbor's bird feeder! Later we did spot a few more species, but in all, it was a quiet day. The snow shoeing was great, though! My earlier post described our year-end work pulling together all our species data for 2008. I have now had time to go through the data unit-by-unit. I was particularly interested in the ridge-top savanna units. Since I now have seven years of data, I am getting a feel for how long it takes for certain species to become established. These are species that are distinctive enough that if they had been there we would likely have seen them. A few of the species that have appeared in some of the savanna units only just this year: NJ tea (Ceanothus americana), lead plant (Amorpha canescens), prairie dock (Silphium terebinthinaceum), butterfly milkweed (Asclepias tuberosa), white indigo (Baptisia alba), purple prairie clover (Dalea purpureum), rattlesnake master (Eryngium yuccifolium), compass plant (Silphium laciniatum), rough blazing star (Liatris aspera). Folks will realize that many of the species on this list are commonly considered "prairie" plants. True. But they do grow in more open savannas (which in a way can be considered equivalent to "small" prairies). Also, most of the species on this list are ones that take a while to get established in a new prairie planting. They are deep-rooted, and don't start flowering until their root systems are well established. They are what are called "conservative" species. If you use Swink and Wilhelm's Coefficient of Conservatism table, they are species with high C numbers. One lesson I have learned here: don't expect everything to show up right away. Another lesson: don't be satisfied with a single planting. Some years have better weather for plant establishment than others. Plant every year you have seed available. 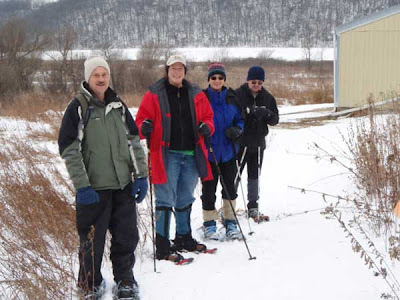 I had to miss it, but Marci and Jim Hess ran our New Year's Day snowshoeing. There had been a bit of fresh snow, and it snowed some more during the day. Ten people in all.